This post is sponsored by Weruva® and the BlogPaws® Pet Influencer Network™. I am being compensated to help create awareness about the launch of Weruva’s new Caloric Harmony™ and Caloric Melody™ Dry Dog Food but we only share information we feel is relevant to our readers. Weruva is not responsible for the content of this article. 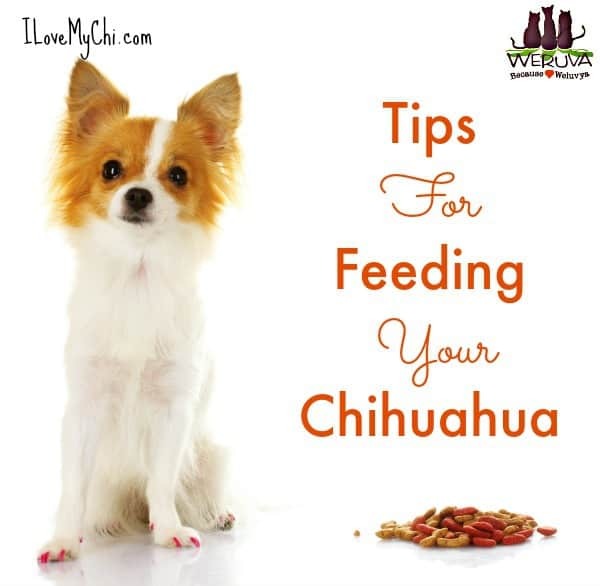 One of the most common questions I get from Chihuahua parents is how much and how often to feed their Chi. Chis tend to either be too skinny or too pudgy and either condition can cause some health problems. If you are struggling with feeding issues with your Chi, then this article will help. 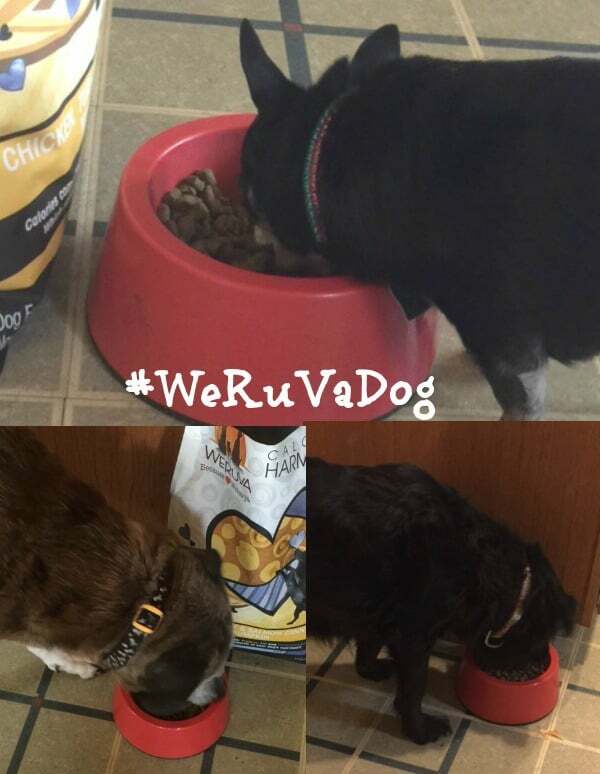 I’ll also share our experience with feeding a premium dog food made by WeRuVa®. How Often Should You Feed A Chihuahua? 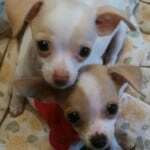 Puppies under 3 months, should always have food available to them so free feeding is best. Puppies 6 months to 1 year old should be fed 2 times a day. Adults should be fed twice a day. If your dog has Hypoglycemia or low blood sugar, he may need to eat more often. Just break up the meals into smaller portions and feed every few hours. You can read more about Hypoglycemia here. 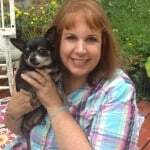 How Much Should You Feed A Chihuahua? This also depends on the age and activity level. Active dogs can eat a little more, while slower dogs should eat a little less. Puppies under a year old should have 50 calories per pound of body weight per day. So a 6 month old puppy that weighs 2 pounds should have 100 calories total, split up into 2 meals (hope that makes sense). Adult dogs between 1 and 7 years old need 35 calories per pound of body weight a day. 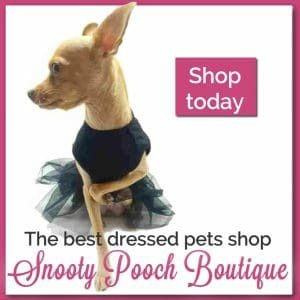 Senior dogs over 8 should have 30 calories per pound of body weight. 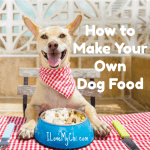 The calories in commercial dog foods differ according to the brand and type so be sure to read the back of the bag or can for feeding instructions. 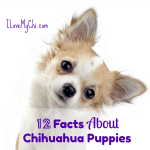 In most cases, a Chihuahua should not have more than 3/4 cup of food total in a day. Feed at the same time and same place every day if possible. 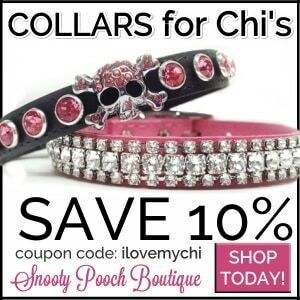 Dogs, and Chis in particular thrive on consistency. Your dog’s food should contain at least 30% protein. If you change the brand of food you are feeding, do it gradually. Start with 1 part new food to 3 parts old food. After a few days, do half and half, then a few days later 3 parts new food to 1 part old food and finally just the new brand of food. Wash food and water bowls often (daily to a few times a week). If your dog is picky, you can add a little warm meat broth to kibble to entice them to eat it. Try to keep the air and moisture out of your dog’s kibble when storing by keeping it in the original closed bag and putting the bag in a resealable plastic container. 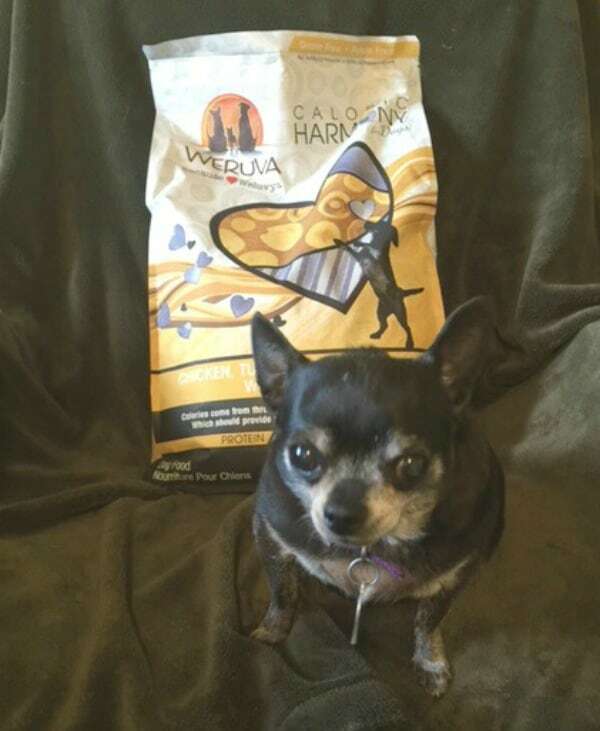 The doggies got to try out a bag of WeRuVa Caloric Harmony and the flavor we tried was Chicken, Turkey and Salmon Dinner with Pumpkin. I’m a big proponent of pumpkin so I was happy to see that in there. Sometimes Kilo has tummy problems and constipation, and pumpkin seems to keep everything running smoothly in that area. All 3 dogs loved it, even my picky Buddy. I was impressed with the quality of this food and I do recommend trying it if you are looking for a a high quality, grain free food. Click here to buy this food (what we tried is toward the bottom of the page). it has pumpkin in it for healthy digestion. My dogs loved it and had no problems switching over to it. It’s responsibly sourced which means nothing from China. Great foe all life stages. One more thing. We weren’t asked to review these but they were sent along with the dog food as a nice little extra. The dogs couldn’t eat them up fast enough but what I really am happy about is when Kilo has her dental surgery (one of 3 different surgeries she needs), these soft foods will be great for her sore little mouth while she is recovering. Also I mentioned in the tips above about adding meat broth to kibble to encourage a picky eaters. Well these packets will do the same thing! Mix some up with kibble and I bet your picky eater will eat it. Before I go, just want to encourage you to check out Weruva on Facebook here. And if you’d like to learn more about their Caloric Harmony and Caloric Melody foods, click here. Have you tried any Weruva products before? What did you think? 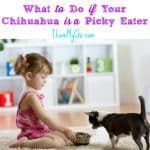 I have a picky eater so I appreciate these tips Cathy! I have never heard of Weruva but will certainly check them out now. Glad they were helpful Susan. I have never heard of Weruva before either but I really love them! Do you know if they have cat food? I think my cat might like to try Weruva. That’s great Pat. Let us know how your cat likes it. Great review! So glad to hear all three dogs loved it! Bruin is loving his Chicken Dinner with Lentils. So impressed with all the healthy ingredients! Chicken dinner with lentils sounds pretty yummy. Yeah I have been really impressed with the ingredients too! Kizer my long hair chi has Wervua every morning. Loves it, then dry food for other meals. You can see the ingredients not just guess with some ground can dog food. 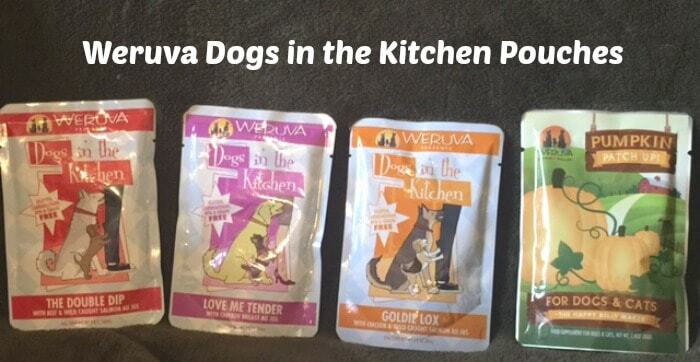 Would love to try some dry Wervua dog food if they have it.